Ali McDonough, Theta Delta – University of Delaware first started the Andrew McDonough B+ Foundation in memory of her brother who was fourteen when he passed away from childhood cancer. The B+ Foundation provides financial support to families of children nationwide while also providing grants for cutting-edge childhood cancer research. Not only has Theta Delta remained actively involved with the B+ Foundation throughout the years, but so has the University of Delaware! Theta Delta shares their fall philanthropy event, Pi Putt, which raised money to support this very special organization. How many times has this event been held? 3 times! Tell us about your event. We teamed up with Kappa Delta Rho Fraternity to raise money for our local philanthropy, the B+ Foundation. Pi Putt is an 18 hole golf tournament and luncheon. Since the B+ Foundation assists families affected by childhood cancer, we had our own sister, Brianna Hancin, speak about her journey beating the disease. Additionally, we had Ali, the founder of B+ Foundation (and our Theta Delta sister), and her father, Joe McDonough, in attendance at the luncheon. How long did it take you to plan and organize? The planning for this event began in the summer months. We began promotion and signups mid-September through the date of our event. How did you publicize the event? Did you utilize your special event chair and/or public relations chair any throughout the planning and promotion process? Both the Public Relations chair and Social Media chair advertised the event using personalized cover photos on Facebook, Flyers that we circulated on social media and on campus. Additionally, we emailed potential sponsors and past sponsors. We spotlighted the event days leading up to the event through Instagram posts. How did you involve the entire chapter and get them excited? The entire chapter was extremely excited for the event because it is one of only two Greek fundraisers at the University of Delaware that is held off campus. 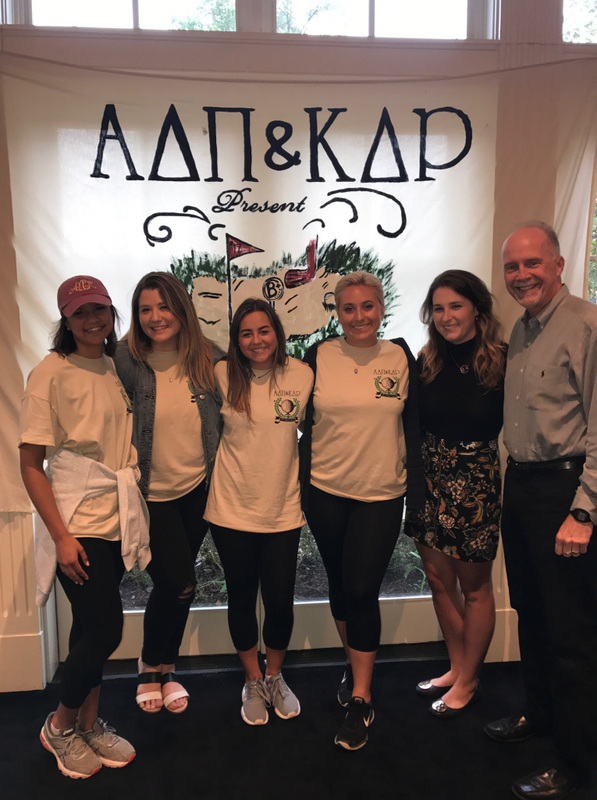 We set up “canning” events where Alpha Delta Pi sisters were paired with the brothers of Kappa Delta Rho and went off campus to collect money for the cause. Additionally, Theta Delta sponsors a local child with cancer through the B+ Foundation, and knowing the money would support children like him motivated the women in our chapter. (If event held previously) What activities did you add for your guests? We included a heartfelt speech from our sister, Bri Hancin (pictured right), who has been personally touched with cancer and was assisted by the B+ Foundation, which certainly showed the participants at the event that their money was going towards an amazing cause. What do you plan to improve/build on next year? Next year we are thinking about adding a silent auction rather than a raffle table. Additionally, we’d like to have a week leading up to this event with several profit shares with businesses on campus.